Nkoli never tire you? Ngbanu... 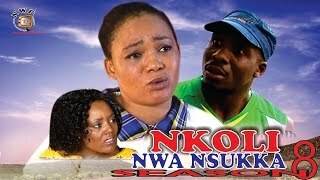 Here's the Season 6 of Nkoli Nwa Nsukka Nigerian Igbo Movie also showing on Nigeria Movie Network. It stars Rachael Okonkwo, Junior Pope Odonwodo, Mac Collins Chidebe, Lacclass Ozougwu and Uju Ozougwu. The Igbo drama series is brought to you courtesy Nollywood Pictures TV. This episode 6 is the sequel to NKOLI NWA NSUKKA Season 1, Season 2, Season 3, Season 4, and Season 5. 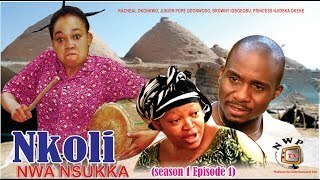 Nkoli Nwa Nsukka Storyline: Following Nkoli’s journey to city and the many challenging events experienced in the city; is a never expected life in the city as the wife of a rich handsome man called Uchenna (Mac Collins Chidebe).Packaged in the movie are very hilarious events and actions associated with this timid girl Nkoli that totally describe the movie as a comedy with the right mixes of action and dialogue. This movie in its comic nature focuses on Nkoli (Racheal Okonkwo) a timid and local girl from a very remote village. Though Nkoli Nwa Nsukka is an Igbo production, the movie is subtitled in English language for the non-Igbo speaking audience. The movie is interestingly funny, so don't fail to watch it just because you don't speak the Igbo language - after all, you may learn a new language; Nigeria Movie Network suggests.